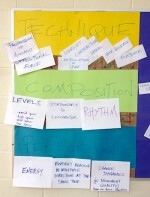 Not only do dancers tend to be kinesthetic learners, we are also very visual. Yet, some of the most under-utilized tools in our teaching toolbelts are graphs and charts within the studio classroom. 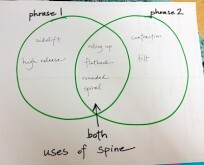 In my early teaching, most of my visual presentation of dance concepts came in the form of listing terminology and the modeling of note-taking for dance history. 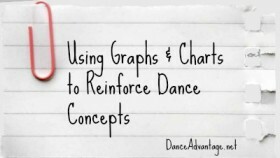 Since, I have come to understand and value the use of graphic organizers to boost critical thinking within the technique setting as well as offering a more well-rounded picture of how dance has evolved and relates to other academic disciplines. Terminology is posted as it is introduced. Just as some studios pride their collection of trophies, we pride ourselves on our collections of ideas. Rather than simply posting the words and their definitions, we often group the concepts into categories, purposes, or over-arching themes. You guessed it: this it a chart that looks like a “T” and offers two columns, within which you can sort all kinds of information. Some of my favorite examples of movement categories: shapes with straight spines and curved, stationary or axial, under curve or over curve, body side or cross lateral, styles of dance, directions or pathways, Western Dance or Non-Western Dance, technical or gestural. 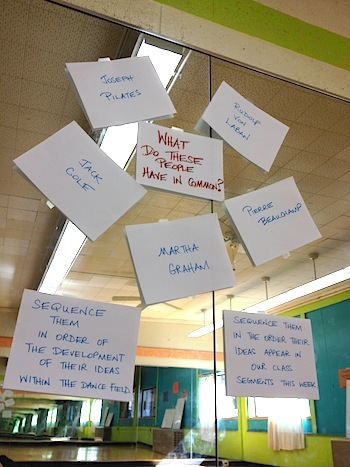 Not only are you sorting ideas, you are also determining how to notate movement in concise ways. Another common feature: two circles that overlap. The result: looking for attributes specific to say, two separate phrases, and some that the phrases share. This is a great way to explore concepts that bridge into other academic disciplines and tracking that information. Examples include: patterns, forces of motion, composition tools, accumulation, uses of angles, theme, and so on. 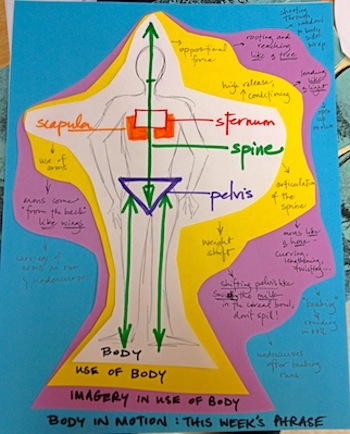 One of my favorite examples though, is the drawing of a “body” and the accumulation of anatomy/kinesiology labeling. From there, the possible uses of those body parts are explored in terms of technical concepts and terminology and then mapped further to chart the theory surrounding the technical notions. Now for this, I actually like to use manipulatives. We use “clotheslines” from string or yarn, and use clothespins to sequence choreographers, development of theory, iconic moments in dance history. I enjoy being able to manipulate this so that it feels less static and brings time to life. We also trade “cards” from time-line to time-line if we are tracing multiple lines at the same time. It is also a great way to spark lively conversation among students – not to mention higher order thinking skills – when they are asked to sequence cards that may be familiar or unfamiliar, hence having to make some educated guesses. Won’t this take time away from actual dancing? I took my time introducing these strategies, mostly because I was concerned about losing valuable “dancing” time in favor of these academic devises. With practice, though, these strategies have proven to be quick and engaging and have gone a long way in shortening the amount of time I have needed to spend on individual concepts. What is in your teaching toolbelt? Thank you! I can’t believe what this has done for student learning ! Love these! I want to know more! Great article! I have a couple of classes with younger girls and boys where it is genereally really about giving them a safe place where they can move around, which is why I at first refused to use visual aids at first. Now, I am considering it, because I will be going through isolations with them next semester and I personally like the ideas of writing down the things we found out last week. How much time do you spent on visual aids etc. in a normal class?